Commander Eric Tufnell RN (1888-1979). 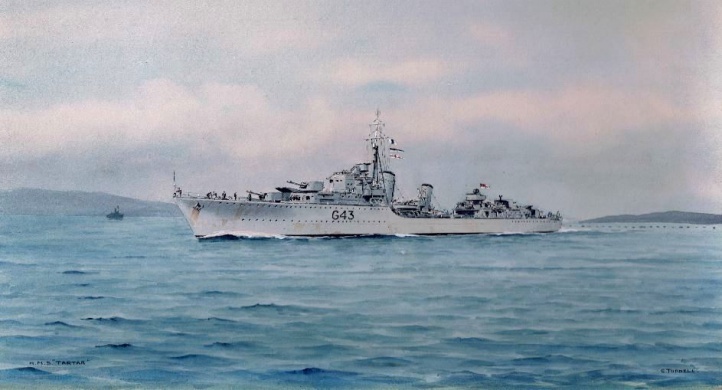 Watercolour signed (LR) and annotated HMS TARTAR (LL). An especially fine Tufnell showing a wealth of detail: the destroyer appears to have passed through the boom defences which now lie astern and the focsle party is closed up, possibly preparing to let go an anchor or to get ready for going alongside. The Jack is being bent on by the signalman ready to hoist in either case and the flag deck has hoisted her pennants.